Study abroad participant Joshua Dean will begin a career this fall teaching French at Central High School. Full Name: Joshua Jacques Dean. Recreation. The greatest benefit of this job is being able to coach kids in various sports." Degree Objective: Bachelor of Arts in English, Associate of Arts in French. Activities: Contributing writer, Fall Line Review, MGA's literary magazine. Shakespeare, Charles Baudelaire, Oscar Wilde and Samuel Beckett are huge influences on my writing and literary thinking. Eventually, I would like to enter education administration." belief that one shouldn't spend too much money in undergrad if one plans to enter grad school. abroad the previous summers. Furthermore, I find the Macon Campus beautiful." 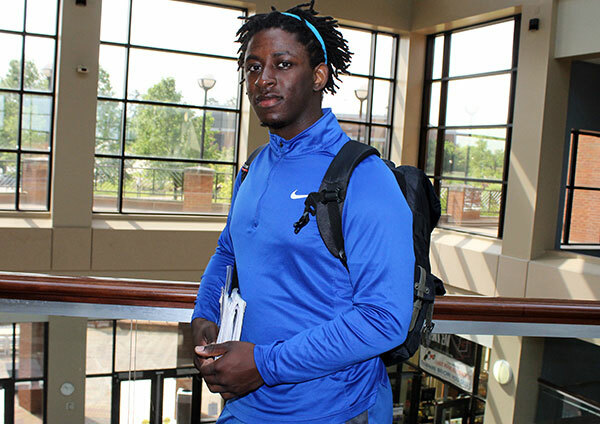 The greatest thing he discovered about Middle Georgia State was ... "The courses are challenging. The professors challenge students and expect them to accept the challenge. One can go anywhere with a degree from Middle Georgia State University." her course. She was able to make learning French entertaining and include some aspects of French culture. Bravo, Dr.Wengier!" would have envisioned being possible. The English department and the Media, Culture and the Arts department are beyond great. The manner in which they encourage me to think uncommonly is remarkable." One thing people don't know about him is ... "I am impatient, but that has helped me to achieve. successful if they were more impatient." especially because I travel internationally and could easily visit the land of my people." the play, 'Waiting for Godot.' I knew then that this would be an excellent opportunity for me."